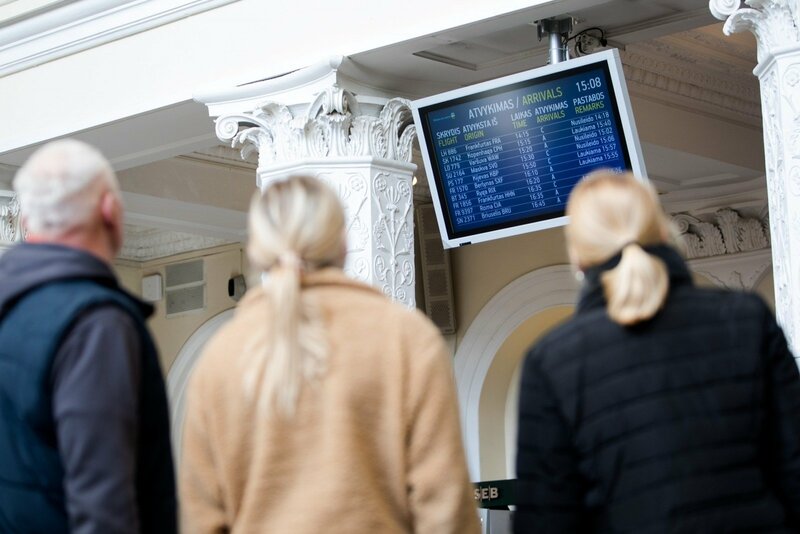 More and more tourists find Baltic countries appealing when they are choosing their new destinations. 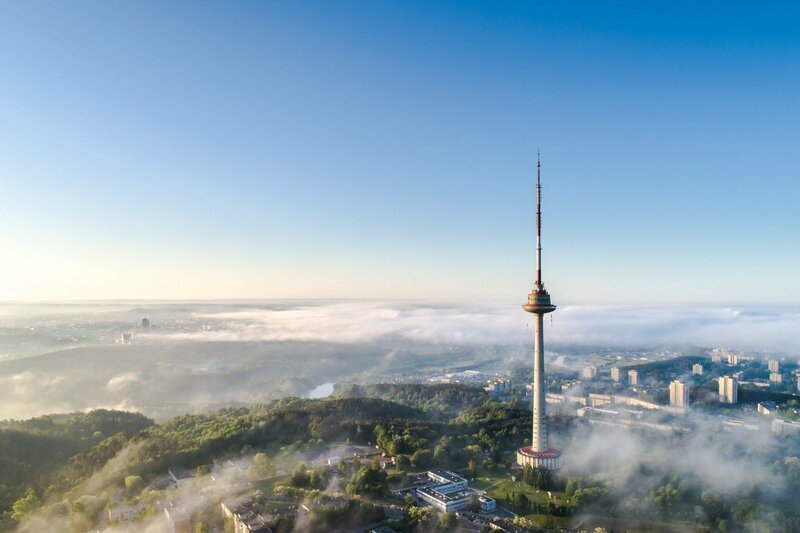 Lithuania sees the growing number of foreigners that are interested in seeing not only the capital of the country Vilnius but also the beauty of the rest of Lithuania. ‘Real is beautiful’. This is how Lithuania invites to see its nature, culture and historic sites. 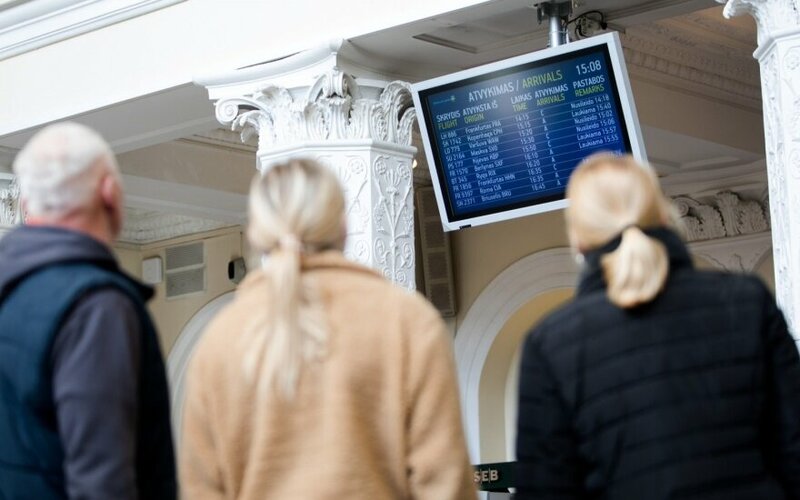 The chief of the Lithuanian Department of Tourism ‘Lithuania Travel’ Dalius Morkvėnas notices that more and more foreign tourists are discovering the country’s regions but there is still more to do. According to him, it is noticed that recently tourists more often choose their destinations by their psychography. ‘The main characteristic of a contemporary tourist is that he or she is seeking experiences and impressions. Consequently, for instance, bird watchers or foodies are intensively discovering Lithuania’ says D. Morkvėnas. Nevertheless, there are some patterns that can be spotted among foreign tourists. For example, Germans are mostly attracted by Curonian Spit or Japanese are interested in the heritage of Chiune Sugihara in Kaunas. ‘For tourists from Israel family-friendly activities are most important. Many Americans search for Soviet relics. And, for example, Chinese adore our traditions and such events as Casimir Fair’, continued the chief of ‘Lithuania travel’. Although Lithuania sees the number of foreign tourist growing there are things that can be improved. As D. Morkvėnas points out there is a need for better research-based marketing in priority markets, improved air connectivity, and raising awareness of Lithuania as an attractive tourism destination. ‘Lithuania can and must position itself as a competitive and worth visiting tourism destination in global tourism map’ adds he. In the latest years, the biggest growth of foreign tourists was in German and British tourists. The number of them coming to Lithuania grew by 20% last year. The flows of tourists from Italy, France, Spain, and Scandinavia increased by 6,9% on average. Also, the growth is seen in the numbers of tourists from the USA (+11,6%), Japan (22,3%). China (20,6%), and Israel (27,3%). 'These markets are significant for the biggest expenditure basket in Lithuania. The United States remain among the top ten states for the second year in succession from which the most tourists arrive. More Americans visited Lithuania than did tourists from neighboring states – Finland, Denmark, Sweden or Norway’, concludes D. Morkvėnas. 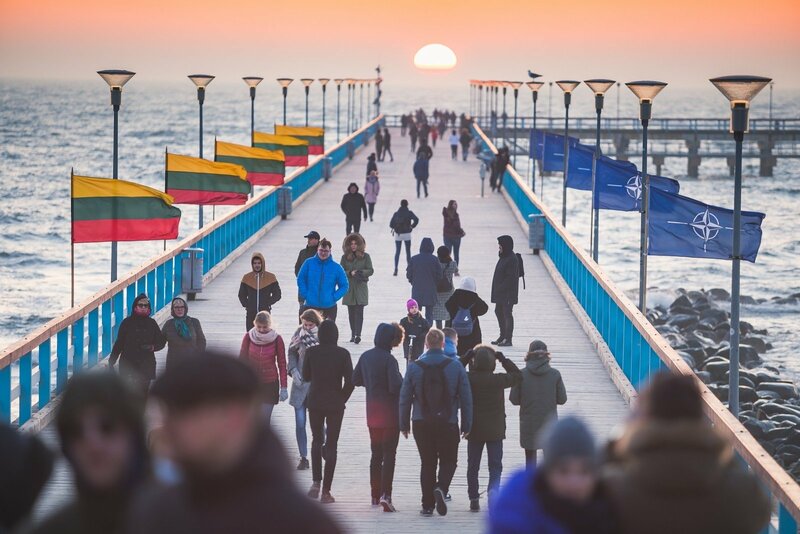 According to Lithuanian Marketing Strategy 2015-2020, the priority inbound tourism markets of Lithuania are divided into four sectors. Germany, the United Kingdom, Italy, Sweden, Norway, and France are seen as target markets. Meanwhile, Israel, Japan, USA, and China as long-haul markets. In the section of important markets lay Belarus, Estonia, Latvia, Poland, Russia, and Ukraine. And perspective markets are Belgium, Demark, Spain, Netherlands, and Finland. 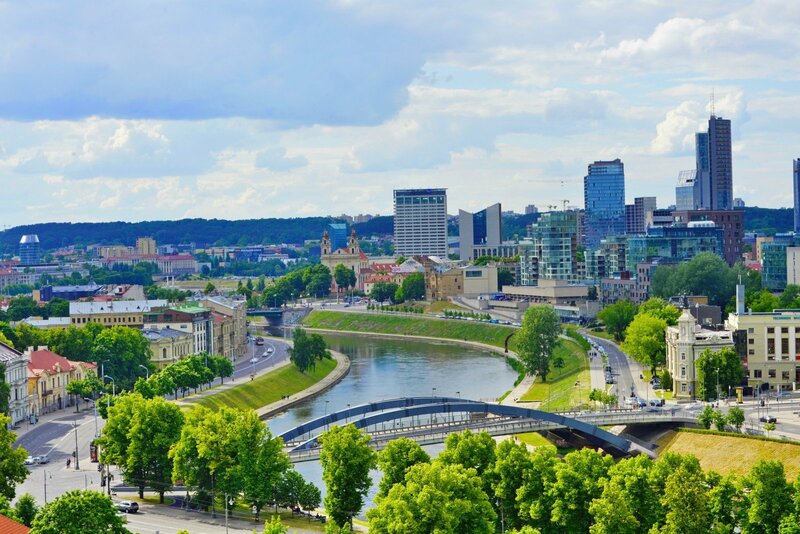 Inscribed on the UNESCO World Heritage List, the historical center of the capital of Lithuania testifies to how organically the city has developed over the centuries. Today, the Old Town of Vilnius is considered one of the most beautiful in Europe. Openness to a diversity of nations, cultures, religions, and forms of expression was and is the city’s calling card. Lithuanian capital city has a stunning medieval old town and baroque architecture that rivals the very best in Europe. Beyond the rich history, there’s also a vibrant culture. The Bohemian Uzupis Republic in Vilnius has its own Constitution and is even called a Lithuanian Land of Oz. 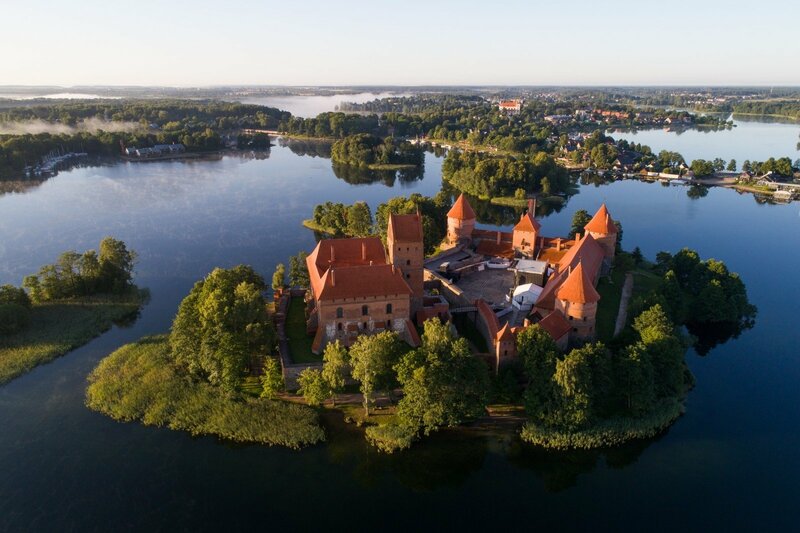 One of the most beautiful medieval European castles on an island could be found in Galve Lake, in Trakai. The magnificent Trakai Castle Complex, built all across the island, became a residential place for the dukes of the Grand Duchy of Lithuania. For those interested in history and mystery, a visit to Trakai is a must. The Castle is one of the most visited tourist attractions in Lithuania. The 300 m wooden bridge leading into the castle, lakes connected with 12 km-long canals, incredibly beautiful halls, galleries, stained-glass windows, frescoes, and secret passages will not leave anyone indifferent. The castle houses a Museum of History, often holds knights tournaments, various concerts and artisans’ days. By the way, you can try yachting or standup paddleboarding around the castle at night. Trakai is also famous for Karaim culture and heritage. Once the temporary capital of Lithuania, Kaunas stands out from other Lithuanian and European cities for its interwar architecture. The extremely high concentration of buildings from this period is making it possible for the city to seek a place on the UNESCO World Heritage List. Today, Kaunas is going through a transformation and becoming a modern city with a unique character and pulsing with life. It is the European Capital of Culture 2022. The sounds of “Kaunas Jazz” and the Pažaislis Monastery music festivals attract audiences from all over the world. Visitors to the former capital of Lithuania rarely miss an opportunity to learn more about the creative heritage of the genius composer and painter M. K. Čiurlionis and to visit the national gallery named after him, which offers a fascinating collection of his paintings. 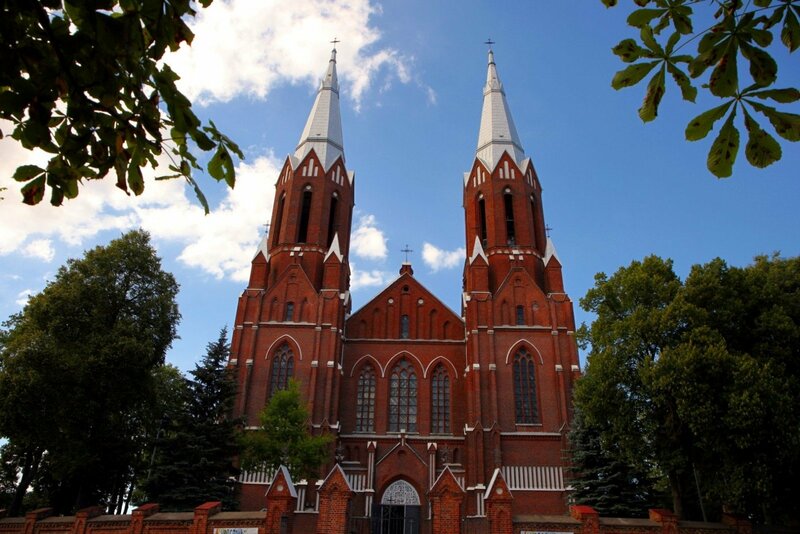 Klaipėda is the oldest city in Lithuania, which was first mentioned as Memelburg in 1252. 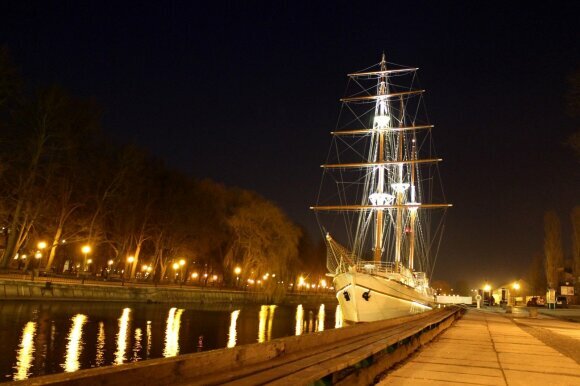 It has the only seaport and cruise ship dock in Lithuania. The seaport is on the routes of cruise ships sailing on the Baltic Sea. Klaipėdas’s Old Town radiates with the spirit of old German cities as the German-built Fachwerk houses are the city’s unique feature. These kinds of construction works were very popular during the first half of the 19th century. Small sculptures in the Old Town tell the story of the city: The Black Ghost, that looks like it is just stepping out of the water via the shoreline; The cat with the face of a gentleman; on the quay of Danės river, at North Horn one can see a girl made out of bronze, standing on her tiptoes and sending a kiss to the sculpture of "Boy with dog" on the other side of Danės river (the sculpture is named accordingly - "The Kiss"). Also – The magical Mouse - one need only whisper into the ear of the mouse and your wishes will come true. Or the steel sculpture "Dragon" which is retelling the origins of Klaipėda. The Kopgalis Fort complex houses the Maritime Museum with an attractive exposition of marine nature and the history of navigation. These unique structures also accommodate a rich Aquarium and a Dolphinarium, hosting shows of trained dolphins and Californian sea lions, which attract many spectators. Another interesting activity of the museum is dolphin therapy for children with disability. Klaipėda cherishes marine traditions– it hosts the Sea Festival on the last weekend of July every year since 1934. This event includes a number of performances of artistic companies and craftsmen’s fairs. This festival is also called the Summer Christmas. 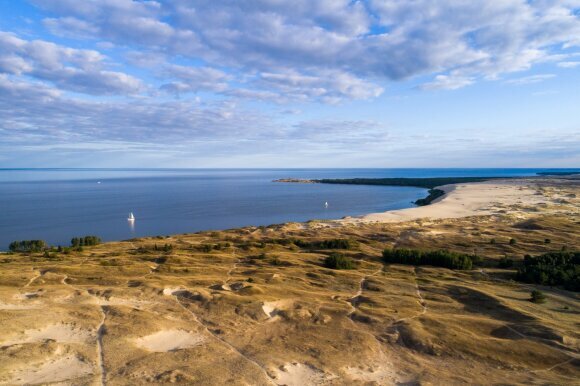 The Curonian Spit (Kuršių Nerija) is among the top beaches in the world according to the Lonely Planet, also announced as a site you must see before you die (1,000 Places to See Before You Die is a travel book by Patricia Schultz). The peninsula, which is just less than 100 km long, is located between the Baltic Sea and the Curonian lagoon and reminds one of a dessert (Baltic Sahara). It is famous for its spectacular towering sand dunes and small fishing settlements. It was included in the UNESCO World Heritage List in 2000 as one of the most beautiful and unique landscapes in Europe. The strip of sand, stretching into the sea, has several cozy, neat and picturesque fishermen’s villages: Juodkrante, Pervalka, and Nida. All of them are connected by wonderful Lithuanian Seaside Cycle Route. Riding a bike you could observe not only sand dunes and pine forests, but also one of the largest cormorant colonies in Europe or Hill of Witches in Juodkrante, which was recognized as one of the most spectacular sculpture gardens in the world! The Lithuanian seaside is cloaked with legends about the amber that washed up on the shore. Visitors can go on amber hunting sea trips, enjoy amber amulet craft workshops or even visit the luxurious amber spa and enjoy an amber massage. This hill, covered with more than 100,000 crosses, is a sacred place for pilgrims and an extremely mysterious object for the rest of the visitors. The Hill of Crosses is located in Northern Lithuania. In 1831 first crosses, symbolizing sacrifices and prayers were placed and their number grew with each year. During the Soviet Occupation, the Hill was facing a dramatic fate. It was declared as a forbidden place and, subsequently, was being burned and destroyed. However, the heavier it was destroyed, the stronger it renewed because people kept bringing crosses during the night despite the bans and persecutions. The most significant event that brought fame to the Hill Of Crosses was Pope John Paul II visit in 1993. 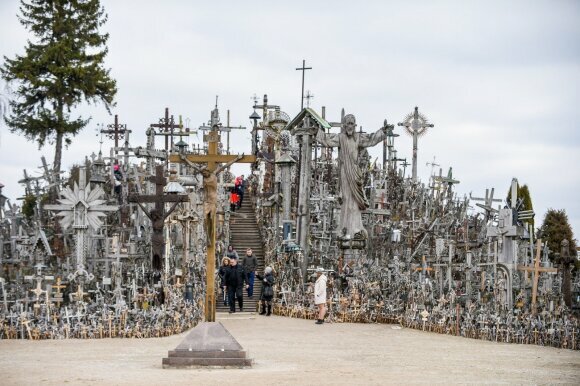 Currently, after one hundred and fifty years of existence, the Hill of Crosses has become a symbol of faith, winning against all obstacles. The wide range of sizes and designs, from stunning, carved wooden to the formed of metal crosses represent the people’s relationship with God while praying for their nation, wishing their family happiness, strength, and good health. Records in various languages, signs of various religions show their importance to people from all over the world. By the way, UNESCO recognizes cross-making as Intangible Cultural Heritage of Lithuania. 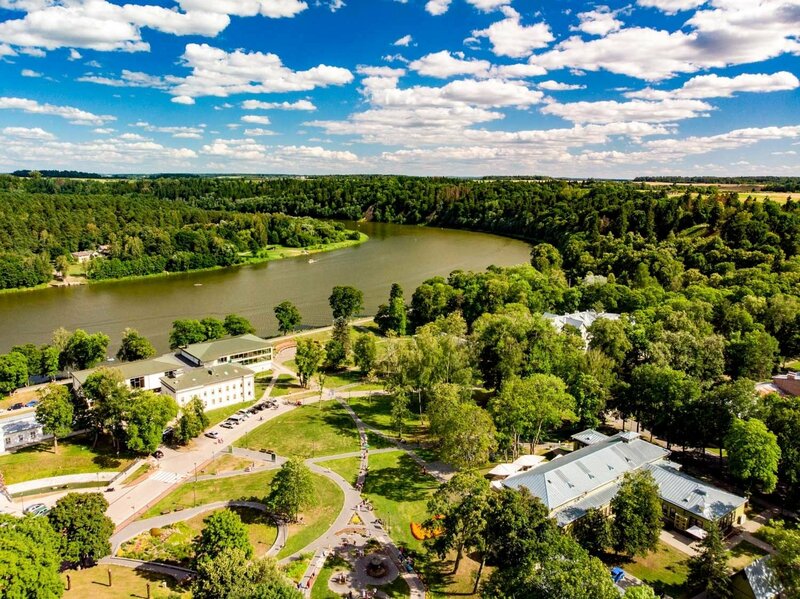 Today Druskininkai is an official healthcare resort and the fastest-growing recreation destination. 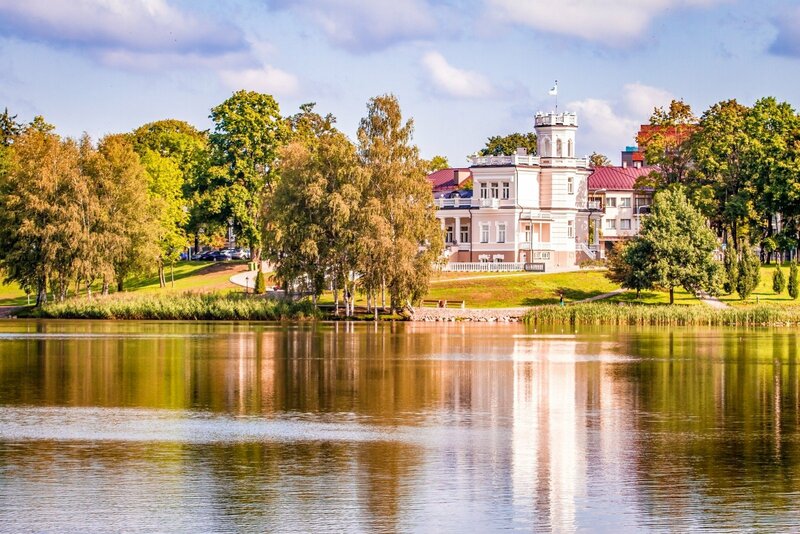 It is the oldest and most famous mineral water and mud bath resort in Lithuania. The strongest magnet of Druskininkai resort is rich family activities all year round – Snow arena, which is the only complex of such kind in the Baltics, aquapark, cableway above Nemunas river, adventure park, and even Tree Cake Museum, the first and the only in the world. Grūtas Park near Druskininkai is recognized as one of the top ten strangest museums in the world. The Park contains more than 50 statues of Soviet-era political leaders. To enhance the experience even further, typical Soviet-era food is available in the Park. Positioning as a quiet green resort Birstonas has a strong focus on quality relaxation friendly to the environment. It is famous for its balneological treatment facilities and is known since the 19th century. The longest and widest river in Lithuania, Nemunas, flows through Birstonas forming remarkable loops. 82 percent of the territory belonging to the Birstonas Municipality is within the boundaries of the Nemunas Loop Regional Park. Here, in the green forests, Lithuanian Duke Vytautas the Great has hunted with the members of European royal families. Guests of the resort not only can taste the natural mineral water but also ‘Kneipp cofe’ there. In line with the unique philosophy of health of German priest Sebastian Kneipp, Birstonas invites to a Kneipp Garden for cold water applications to harden the body and strengthen the immune system. Open-air graduation tower in Central Park with mineral water fountain provides ‘sea effect’ and lets visitors of Birstonas inhale healthy air enriched with minerals. 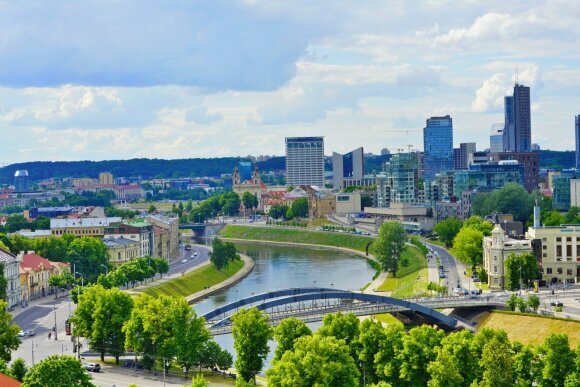 Summer Capital of Lithuania. This resort by the Baltic Sea is famous for white sand beaches and its dunes. Tourists from all over Lithuania and abroad come for its seaside landscape, entertainment and treatment procedures. Every year Palanga attracts visitors to popular Smelt Festival. This is one of the merriest events on the coast in winter. Fishing traditions, history, and culinary heritage are all part of the celebration, but the highlight of the event is smelt – a fish with a distinctive smell reminiscent of fresh cucumbers – tasting, smelt grilling championships and election of the Smelt Cavaliers. Anyksciai resort area allures visitors with its blue lakes and forests, cultural events and historical heritage. At the local wellness and medical centers, visitors can find mineral water swimming pools, saunas, salt rooms; everyone is able to enjoy therapeutic and relaxing massages and other pleasant health, treatment, and wellness procedures. Anyksciai Regional Park draws visitors in with fresh pine forest air and a wide variety of landscapes. 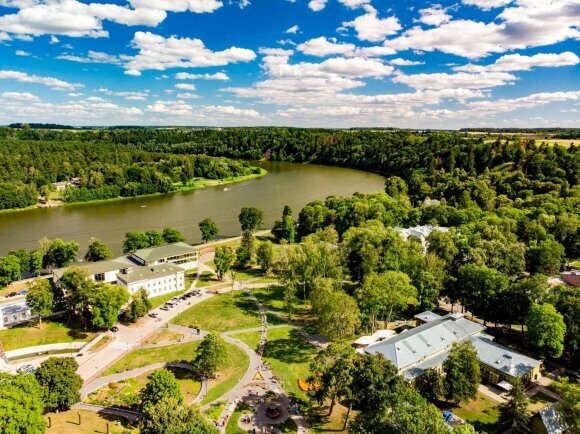 Among the local attractions is the legendary second-largest Lithuanian boulder Puntukas, as well as the country’s most popular tourist attraction – Treetop Walking Path. This is an innovative structure that allows one to stroll through the treetops at a height of 21 meters and enjoy the surrounding area from the top of an observation tower. Few kilometers away from Anyksciai town there is a unique Horse Museum in Niūronys village. In the museum’s ethnographic homesteads educational programs “Daily bread” take place. There one can get acquainted with the important symbol of ethnic culture – the way of bread, from rye seeding to the slice of bread. Also, Anyksciai is home for Narrow Gauge Railway, a highly valuable object of the country’s historical and cultural heritage. Presently operating line Panevėžys – Rubikiai is approximately 70 km length. This historical tourist train not only provides regular short journeys that are organized in May-October from Anykščiai train station but also individual trips. One can book the whole train for a trip with cheese tasting, folk music, legends or even ‘robbery’ by Tadas Blinda (Lithuanian Robin Hood). Also, festive trips are being organized for special occasions, e.g. Mardi Gras, National day, Midsummer day, etc.